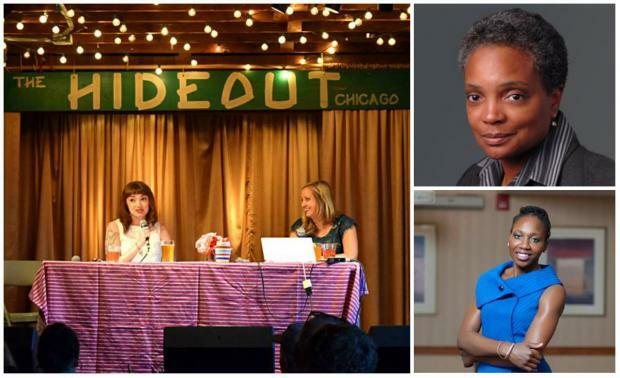 On Tuesday, Girl Talk hosts Jen Sabella and Erika Wozniak will be joined by special guests Lori Lightfoot, Chicago Police Board chair and chair of the Chicago Police Accountability Task Force and Amara Enyia, a municipal policy consultant who took on Rahm Emanuel when she ran for Mayor of the City of Chicago in the 2015 municipal election at just 30 years old. CHICAGO — Is Lori Lightfoot too hard on police? Or is she not holding them accountable for misconduct? The Chicago Police Board President has critics on both sides of the argument, but that hasn't stopped her from doing her job — arguably one of the most difficult positions in the country right now. On Tuesday, you can hear from Lightfoot herself at the Hideout's new political and culture talk show, The Girl Talk. Aside from her roles as police board leader and chair of the Chicago Police Accountability Task Force, Lightfoot is also a partner at the Mayer Brown law firm and a former federal prosecutor. Tuesday's show comes on the heels of a Chicago Sun-Times report showing that officer firings are up and police acquittals are down since Lightfoot took over. "In 2001 she graduated from Crete-Monee High School, where she played basketball and soccer and ran track. She went to the University of Illinois at Champaign where she majored in broadcast journalism and was editor-in-chief of the school newspaper. Then she got a PhD in educational policy. And then she graduated from Champaign's law school. And then she learned to fly a jet plane—just kidding. She speaks Igbo, Spanish, French, Portuguese, and English. She runs about seven miles a day. She's participated in two Ironman competitions—those super-insane triathlons where you swim 2.4 miles, bike 112 miles, and run a marathon." The Girl Talk features candid conversations with interesting, powerful and prominent Chicago women. Past guests include Friends of the Parks' Juanita Irizarry, WNBA star Imani Boyette, Ald. Sue Garza (10th) and activist/rapper Jessica Disu AKA FM Supreme. It's hosted by me (Jen Sabella) and public school teacher and activist Erika Wozniak and kicks off at 6:30 p.m. at The Hideout Inn, 1354 W. Wabansia Ave. Doors open at 6 and the show runs about an hour. $5 at the door. Hope to see you there! Oh! And contrary to popular belief, men are welcome! There will be women on stage, but we think you guys can handle that.